This 14 minute lesson goes over the basics of Virtual Trace, including methods for choosing a Trace Reference, and an explanation of all the buttons and functions in the Trace and Reference Palette. Virtual Trace was introduced as one of the major new features in ArchiCAD 11 and has remained fairly unchanged over the next several versions. It allows any View or Layout to be overlaid on top of or beside any other View or Layout for comparison, alignment or reference. My article of March 2008, originally published in AECbytes, is an excellent supplementary reference to this video lesson. In addition to explaining the basic functionality, it includes many illustrated examples of usage. You will find a copy of the original article on ArchiCAD Virtual Trace posted on the main Bobrow website, and a PDF version is supplied as a download below. 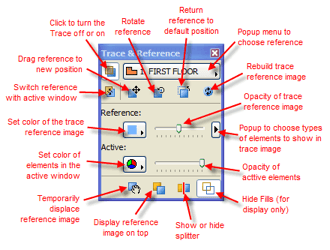 This concludes our introduction to Virtual Trace and the use of the Trace and Reference palette and all the various buttons and functions that allow you to manipulate the Trace Reference. This has been Eric Bobrow, I look forward to reading your comments and questions on the page down below. Thanks for watching. I’m glad to share this with you so that you can start taking advantage of this wonderful tool that we have available to us in ArchiCAD!